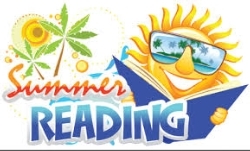 Independent reading throughout the summer is invaluable. Researchers not only found that students learn more slowly during the summer, but some students actually go into reverse. The reversal is even more significant if students fall under low-income status. However, there is good news! Jimmy Kim’s study showed that students who read 4 to 6 chapter books during the summer stave off the typical ‘summer slide’. The only way to get better at something is by doing. I’ve never heard anyone say, “I wish I would have read less.” Besides improving reading skills and comprehension, books can teach kids so many things. Author Walter Dean Myers said that books took him places he never could go, taught him things he never would have learned, and saved his life. Students who read, succeed! Parents, how can you help? In addition to chapter books, magazine articles, news reports, closed caption TV, etc. can be good resources. Compare books vs. movies. Your kids are bored? Give them a book. Keep books with you wherever you go. Let your children see you read…and read WITH them. It’s a great way to bond! Discuss what your children read. Ask questions about what they like, don’t like, etc.